Help grant a boy's wish to go to Atlantis! As part of the community of game-changing trailblazers and top business leaders at The Forbes Under 30 Summit, we invite you to help grant wishes for children with life-threatening medical conditions. Your gift will support the upcoming wish of an 11-year-old boy from Eastern Massachusetts who wishes to go to Atlantis Resort in the Bahamas. He is so excited to swim in the turquoise ocean water and enjoy the waterpark! Most of all, he’s eager to have fun with his family in a place far from the hospital and to focus on something other than his leukemia treatments. Wish kids are brave and they are remarkable. Their wishes are as diverse as their stories from this trip to Atlantis, a wish to work in a pickle factory, become a superhero, or go snorkeling… to giving a baseball team new uniforms or pushing all of the buttons in a tall building's elevator. Their innocence and unexpected wisdom stay with you. A wish-come-true helps children feel stronger, more energetic, and more resilient as they undergo difficult medical treatments. 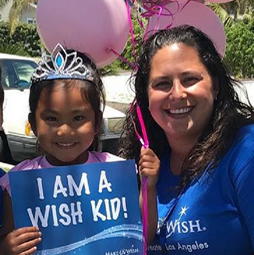 Doctors, nurses, and other health professionals observe that the wish experience works in concert with medicine, improving emotional and even physical health. As an integral part of a child’s treatment journey, a wish can replace fear with confidence, sadness with joy, and anxiety with hope, while uniting and strengthening families. Wishes are life-changing and their impact is long-lasting. Help a child embrace the carefree joys of childhood as they experience life beyond illness. Transform a wish child’s life by donating today! To read inspirational stories of our wish kids and the impact of a wish, visit http://www.massri.wish.org/wishes.